Today, we are kicking off HOLIDAY EXTRAVAGANZA! Holiday Extravaganza is a time for us to hold each other accountable, as we work towards our goals for this holiday season! This week, we are challenging each of you to food journal for the whole week! If you complete this challenge, send us a picture to transfitathens@gmail.com and you will be entered to win a FREE session! Time for the Holiday Extravaganza, and time to weigh in BEFORE Thanksgiving! If you would like to participate this year, please e-mail us, transfitathens@gmail.com, to find a time for you to come weigh in! Feel free to invite friends & family to play as well. The pot will be huge this year, but hopefully everyone will take their money back! Here's how it works: We will begin the challenge the week of November 14th. In order to play, any person who wants to play puts $20 in the bucket. You will weigh in and do your best over the holidays to eat right, exercise, drink water, and do our weekly challenges. On the week of January 6th we will weigh in again. If your weight stays the same- you get your $20 BACK! If you gain weight, your money stays in the bucket and you contribute to the biggest looser prize! If you are the biggest loser (we use % of weight lost) you get to keep all the money in the bucket! The Holiday Extravaganzas is the best way to keep you accountable over the holiday season! Let's do it! Winning baskets from last year! 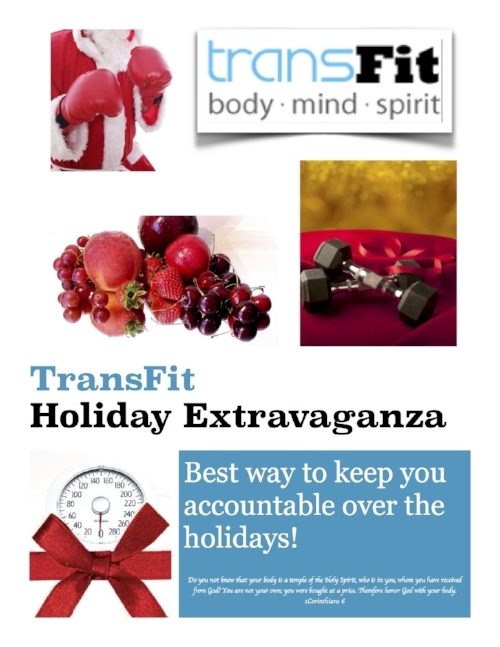 If you have any questions about Holiday Extravaganza or any of our upcoming events, please email us at transfitathens@gmail.com. We can't wait to see you in the studio this week!